Situated on St Paul’s Road, Racks is situated underneath The Clifton Hotel and (according to Vouchercloud) actually used to be the hotel’s coal cellars. We stuck to the terrace, but the inside of the venue is a warren of rooms and individual areas, each of which can be booked for events and hospitality functions. 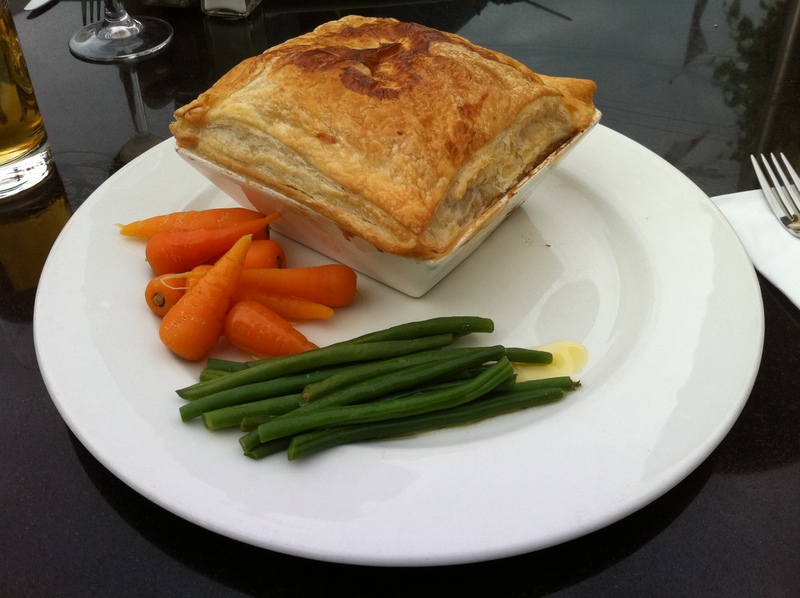 The menu is fairly extensive, and predominantly British with a number of Mediterranean-influenced dishes. 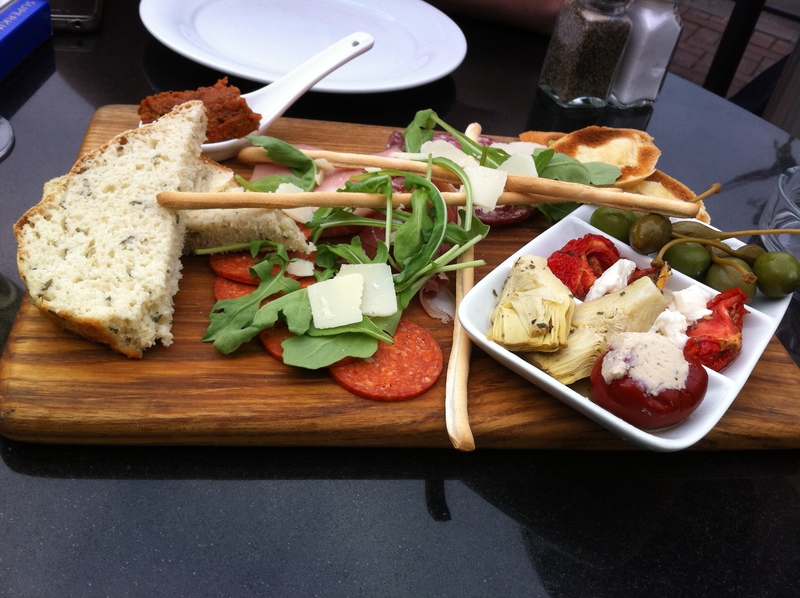 It was one such dish that we chose as our starter: an antipasti board of meats, cheese, breads and marinated vegetables (£7.25 for one, £12 for two). Our starter arrived on a wooden board and was beautifully presented. Highlights for me were the soft, herbed bread, the huge caper berries and the sundried tomato paste (not on the menu, so a nice bonus!) that was heaped onto a ceramic spoon at the side of the board. 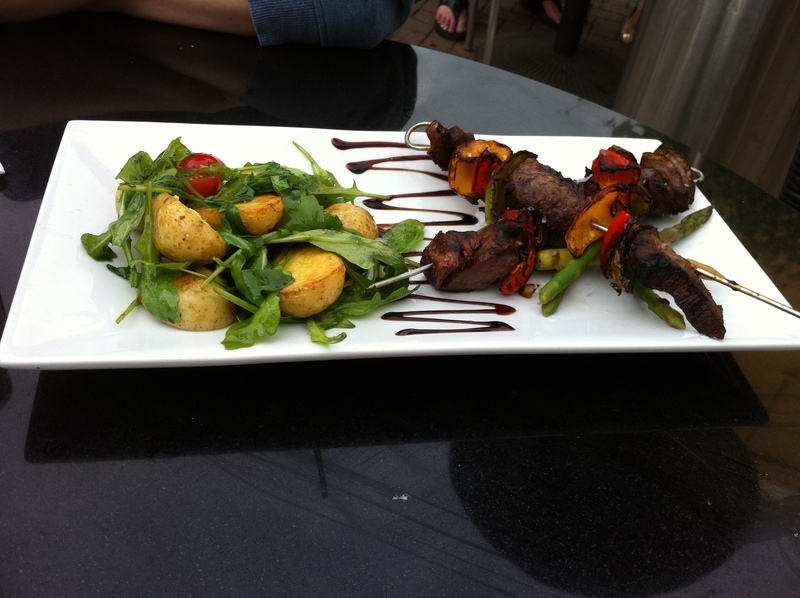 Onto the mains, and Laura had ordered the balsamic beef, red onion and pepper brochette with a new potato, asparagus, cherry tomato and tarragon salad (£9.50). Despite asking for the peppers not to be included, they were still very much there when the plate of food arrived – our waitress did come out to apologise halfway through the meal, though, telling us that she had relayed this to the kitchen when we ordered. Unfortunately the beef was quite tough and chewy, so a lot of Laura’s main was left untouched, and only one of the two brochettes included the advertised red onion which was a little odd. Having heard good things about the pies, I decided to go for the tarragon chicken, wild mushroom and bacon variety (£7.95), advertised as being served with seasonal vegetables. I was a little disappointed with the vegetables – baby carrots and green beans swimming in butter – but the pie itself was lovely. The puff pastry top was crisp on top yet still fluffy in the middle, and was cut open to reveal generous quantities of chicken, bacon and mushrooms. It’s easy to overpower a dish with too much tarragon but Racks got it just right. Lovely. We didn’t stay for dessert – we’d eaten too much, I had somewhere else to be, and we were keen to get off the terrace after dodging wasps during our main courses! Instead we headed inside to the bar to pay our bill, and were greeted by a very friendly and chatty barman – you really can’t fault the enthusiasm and general demeanour of the staff in this place.